Heat up the machine frame, machine head and filter changer to the set temperature before operation. The machine frame, from the inner mouth of the feeder to the flange, is one to five sections. When heating up the machine for the first time, you should adjust the machine head, filter changer and flange to the set temperature and heat up first. 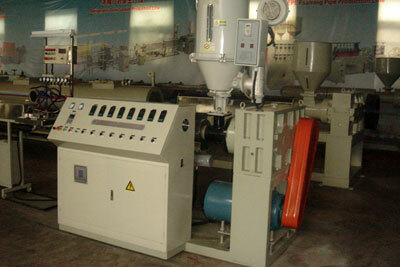 The temperature of the machine frame should be 20~30 centigrade lower than the set one and heat up ahead of time. After they all heat up for 30 minutes, adjust the temperature of the machine frame to the set one, and keep temperature for 15-20 minutes and then you can start the machine. As a rule, when heating up, the cooling fan in the one to five sections of the machine frame should be at “Auto” position. After all heating up sections come to the set temperature, switch on the main motor, adjust the rotate speed of the screw to 5rpm/min, extrude gasket slowly, observe it adjust the extruding speed according to the reality and product requirements, pay attention to the electricity of the main motor, the maximum rotate speed of the screw is 60rpm/min. 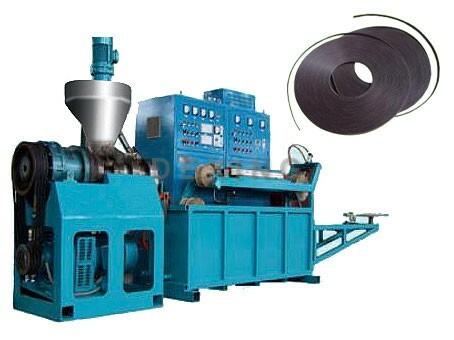 Extrude gasket for a period of time，the extruding pressure will increase because of the increasing impurity form the raw material on the filter. When the number comes to 15MPa, change the filter to ensure the quality of the products and safety of the equipment. Switch on the oil pump of the hydraulic filter changer before changing the filter. When the pressure of the oil pump comes to the set one, the motor stops, press the filter up or filter down button to change filter and clean out left materials. Notice: when press the filter up or filter down button，you should press it until one stroke is finished to make sure the filter comes to its accurate position.